Coming out of (make that, roaring out of) the rock and soul tradition rooted in classic Tower of Power and White Trash, The Groove Hogs are one of the baddest horn bands to shoot through a pair of speakers in many years. No Small Feat qualifies as the best indie release of the year for these ears, and will certainly make my Top 10 list for 2000. Front man Ron "Handbag" Hanson sings with passion and power, at times reminding of early Edgar Winter minus the Bobby Blue Bland-isms. He also plays a crisp, tight harp that will cause many an ear to stand up and take notice. Brian Grussell's Hammond and piano work is flat-out wicked. Paul Kiel's scorching guitar work at times calls to mind original Chicago guitarist Terry Kath --- at least for its seeming contrast to what the horns are laying down, while actually complimenting each tricky turn in the well-crafted charts. And those horns! These guys cook with hi-test gasoline. All this musical merriment is anchored by pocketmeisters Robbie Maertz on bass and drummer John Stelzer. Looking at the cover, one might assume these guys don't like being taken away from the work/play at hand. There are some pretty surly looks gazing back out. Fortunately, it doesn't describe the musical mood. This is joyful music from a ten-piece that obviously revels in the groove (natch). Pat Phaelen (trumpet), Chris Anderson (alto), Steve Johnson (tenor), Tom Vanden Avond (trombone), and Adam Plamann (baritone) comprise the power source. Each is a monster, and the charts are nothing less than brilliant. The listener is not only not met with rote clichés at every corner, but is treated instead to tonal combinations and phrasing --- punchy to dissonant, almost like BS&T in sections --- as catchy as they are fresh. All but two of the assembled ten numbers are from band members Keil, Anderson, Plamann or Grunnelle. Count that among the band's strengths, as well. These are solid, well-crafted songs. "Tall & Proud," "It Takes Two" (Not the Marvin and Tammi hit), "Don't Sweat The Small Stuff" --- there's nothing here not to like. Handbag's vocal delivery is top-notch and the band that he floats atop is a singer's dream. "Suzanne's Song" has a stark trumpet intro followed by Hanson and company delivering a 50s-style balladic love song. To highlight their versatility, the hogs follow it up with the mid-tempo funk of "Any Better Than This." The groove doesn't get any better than that represented by this song. These Groove Hogs deliver world-class little big band blues. They don't just hog the grooves, they re-invent the greasy groove and make it their own. Unless you live in Wisconsin, you're not going to find this. 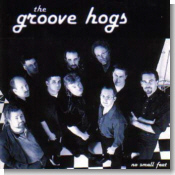 Check out their website (www.groovehogs.com) and send those cards and check-bearing letters today.